Between April to December, 2014, public sector banks in India incurred losses to the tune of Rs 11,022 crore due to 2100 cases of fraud. These numbers were revealed in a report shared by Reserve Bank of India last week. In all the 26 PSU Banks under Government of India, all frauds which were higher than Rs 1 lakh were analyzed for the 9 month period between April to December, 2014. Out of the total frauds, Punjab National Bank reported maximum amount: Rs 2306 crore, with 123 cases of fraud. 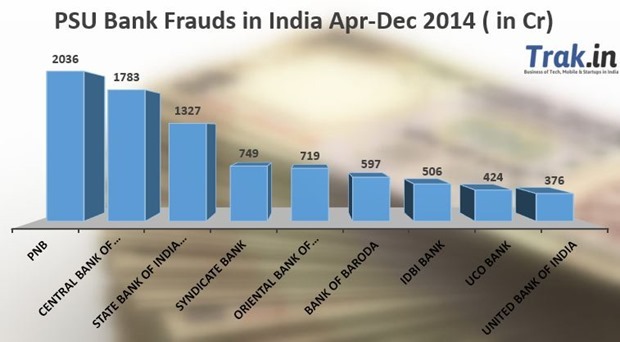 On the other hand, SBI reported maximum number of fraud cases at 474, but the amount of fraud is low: Rs 1327 crore. In fact, total frauds discovered between this 9 month period has already surpassed the total frauds reported during 2013-14 fiscal year, when 2593 cases of fraud resulted in loss of Rs 7542 crore. Thus, between the period April to December, 46% more amount was lost due to frauds compared to last full year. What exactly is a fraud? As per RBI, fraud can be “loosely” described as “any behavior by which one person intends to gain a dishonest advantage over another”. As on March 31, 2013, commercial banks reported total fraud of Rs 1,69,190 crore from 29,910 cases. In 2012-13, Rs 13,293 crore of fraud was detected in all PSU banks in the country. For more details on the frauds as shared by RBI, you can visit here. "Rs 11,022 Crore of Frauds Discovered In Public Sector Banks Between Apr-Dec 2014", 5 out of 5 based on 1 ratings.